According to a recent Edison Research study about the growth of podcasting (the 7th annual research study conducted by Edison), more and more Americans are listening to podcasts. Many digital pundits scream from the rooftops about the latest social network tool or niche, and podcasting continues to chug along growing in popularity. Book lovers and readers have a bounty of book podcasts to choose from. However, outside of searching on iTunes or doing a basic Google search, it’s often hard to find podcasts. And the reality is that many podcast listeners are opting for a variety of podcast apps to listen and find podcasts vs. using iTunes. 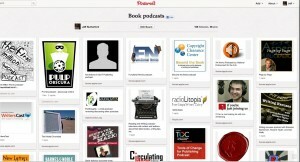 With that in mind, we burned the midnight oil several months ago at ToBeRead and created this Pinterest Pinboard of 55+ book podcasts. If your favorite book podcast isn’t on the list, drop us a line and let us know and we’ll add it to the list.